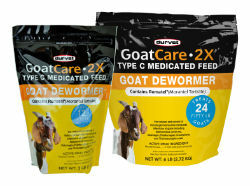 FDA Approved for use in all classes of goats for the removal and control of mature gastrointestinal nematode infections of goats including Haemonchus contortus, Ostertagia (Teladorsagia) circumcinta, and Trichostrongylus axei. Economical double strength formula - 4 oz. per 50 lb of body weight No milk withdrawal. 30 day slaughter withdrawal Convenient, single dose treatment at any time during production cycle, helping you to strategically deworm the entire herd. Palatable, stable in any meal form. Very safe. Rumatel®, when administered during safety trials at twenty times the recommended level, produced no adverse reactions. Backed by years of safe use in goats. Does not adversely impact reproductive performance. May by used frequently. Conditions of constant worm exposure may require retreatment within 2 to 4 weeks. 4 oz. measuring scoop included inside every bag for simple dosing. Options: 3 lb. 6 lb. Feed as a single therapeutic treatment at 0.44 grams of morantel tartrate per 100 pounds of body weight. Fresh water should be available at all times. After medicated feed is consumed, resume normal feeding. Conditions of constant worm exposure may require treatment in 2 to 4 weeks. When used as a top dress the medication as well as the underlying feed should be evenly distributed.